Dwayne Perreault - I’m house sitting in the Languedoc, and I can’t help but feel a bit jealous. Wouldn’t it be nice to have this for myself – a four bedroom villa with a heated swimming pool and a garden with olive and orange trees? 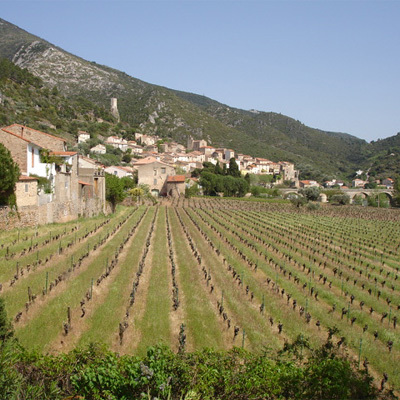 From the balcony, the view looks out onto a field with 20 year old Syrah vines, single Guyot-trained, stretching in perfect rows to the village of Roquebrun with its thousand year old tower perched on the mountain. In the pale moonlight, the vines look like dark tombstones and it is as if I am looking at some monumental battlefield where soldiers are buried. Instead, these are the vines which produced the very wine I am drinking, the Saint-Chinian, Prieuré Saint-André “Cuvée Andréus” from Michel Claparède. A Syrah/Carignan blend, and I am crazy about old Carignan, since Carignan is crazy. I know of no other grape which has such outspoken wild berry flavours which stab you in the nose and palate. It needs to be tempered with the more serious Syrah, but together they are perfect counterparts, like Dean Martin and Jerry Lewis (Carignan would be Lewis, who by the way is in the French Légion d’honneur). Just behind me is the Cave de Roquebrun. Their metallic tanks rise above the cyprus trees, and they pride themselves on making wines from carbonic maceration. 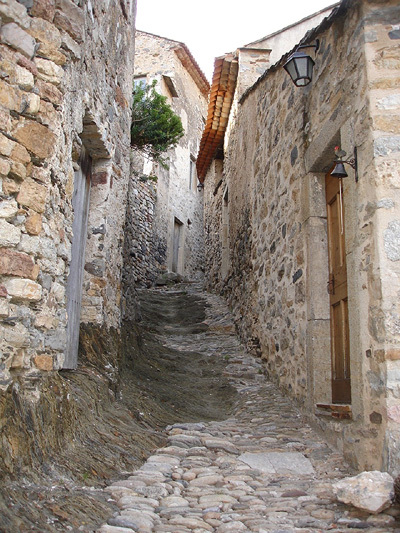 It’s a case of old world meets the new in Roquebrun, but walking down these ancient cobblestoned streets leads to a feeling of temps perdu, when wine itself was wisdom, in vino veritas. As if the truth was ever that simple… drink the wine at room temperature and it is silky and solid, well rounded and in balance. Leave your glass outside in the cool night air for 15 minutes and the Carignan begins to take over, as if someone had stuffed a bunch of wild raspberries and cowshit in your mouth. Which is better? It’s a matter of taste, I suppose. Nearby runs the river l’Orb, incessant and indifferent. Wine has been made here for 2500 years, but if you listen to certain well versed parrots, the Languedoc was created to produce bulk wines for blending and has never escaped from that stigma. Nothing could be more untrue. Much of Bordeaux and Burgundy is over-priced. 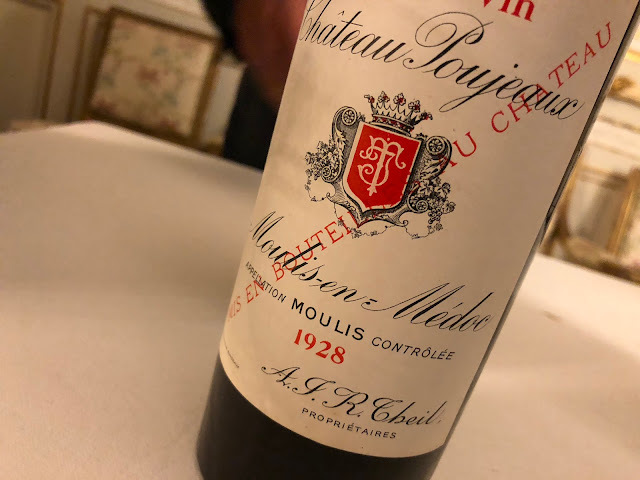 Chinese businessmen are driving up the value of Lafite Rothschild and Duhart Milon, only to mix it with Coca-cola. The Languedoc makes wines for everyone, and at prices most people can afford. So, while David keeps you updated in the coming weeks on the important developments in the Bordeaux primeur campaign, I will be content to blog the Languedoc. First, I will report on Lidewij van Wilgen, the Dutch owner of Mas des Dames, an estate which recently received 91 points from the Wine Spectator and is rapidly gaining international attention. Proof of this is the recent visit of 13 sommeliers from star restaurants in London, including Gordon Ramsay’s Maze, The Connaught and Midsummer House. My next posting will be about Château de la Negly, the most distinguished producer of La Clape, perhaps the Languedoc’s most renowned wine. After that, I will turn my attention to the wines of Domaine Paul Mas, one of the most succesful estates in the entire region.